Tasting side-by-side-by-side the new India pale ale trio from Samuel Adams is akin to turning up the volume on the radio as an excellent band starts to play, hits a stride and then brings it home. Samuel Adams is no stranger to hops, nor IPAs, but last year’s foray into large-scale production of its “West Coast style” Rebel IPA brought attention—and big sales—to the hop-forward collection. The brewery follows up with a session IPA and a double IPA to complement the relative-straight forward initial offering. 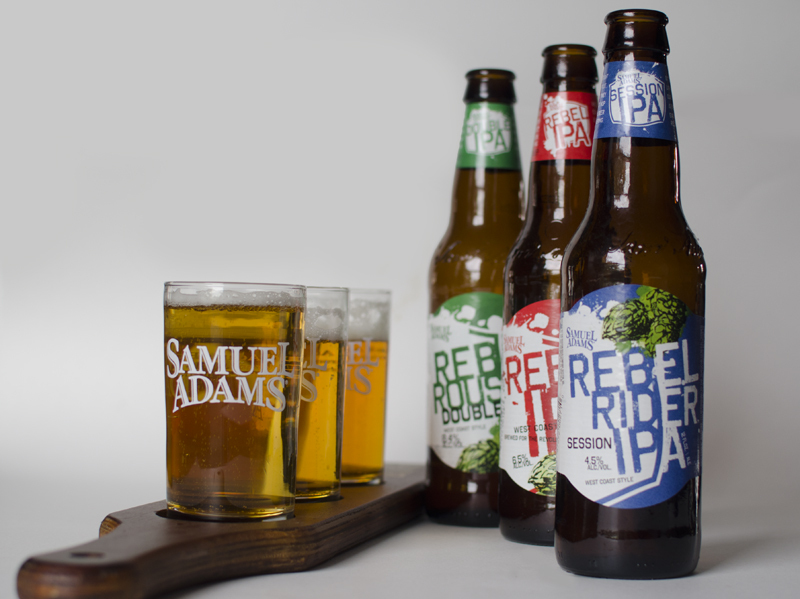 Rebel Rider IPA has a thin mouthfeel, a caramel-like sweetness and a rustic, earthy hop nose. Staunch hopheads might say this isn’t an IPA in the modern sense, but students of history will recognize the style’s British roots in this beer. Rebel IPA brings on some of the chewiness and familiar resin and grapefruit hop character. The malt sweetness is there too, like nougat. A slight alcohol warming and a lasting pleasing bitter finish, makes this a solid IPA for beginners and hop enthusiasts alike. Rebel Rouser brings to the glass the flavors and sensations that most have come to expect from “West Coast style” IPAs. Here’s that dank hop profile, the sticky mouthfeel, the lightly harsh boozy bite and lasting bitter finish. IPA is the best selling craft beer category, according to industry statistics, and these brands will—because of the trusted Samuel Adams name—likely bring new drinkers into the hop-forward fold. All are approachable in their own way and help serve as a solid foundation for India pale ales. John Holl is the editor of All About Beer Magazine and author of “The American Craft Beer Cookbook.” He lives in Jersey City, NJ. Contact him via Twitter @John_Holl or email. THIS BEER IS BAD BAD BAD !!! BAD !! IT IS NOT BEER, IT IS AN ALE. BIG DIFFERENCE, I PERSONALLY DO NOT CARE FOR ALES. IT SOUNDS LIKE YOU DONT EITHER. the literal definition of an ale is “a type of BEER with a bitter flavor and higher alcoholic content” you are wrong. Put your ‘swords’ away boys. To each his own. If you don’t like the product or the review, spend your money and time elsewhere. Rebel double ipa, an awesome beer! Highly recommend. If you like hopnosh you’ll love this. Very similar taste but much smoother. I love ales. This is a steady average IPA, citrusy start, lingering mild bitter, sweetish aroma. Resiny hops. Not distinguished but drinkable. Not my fave IPA but not awful.